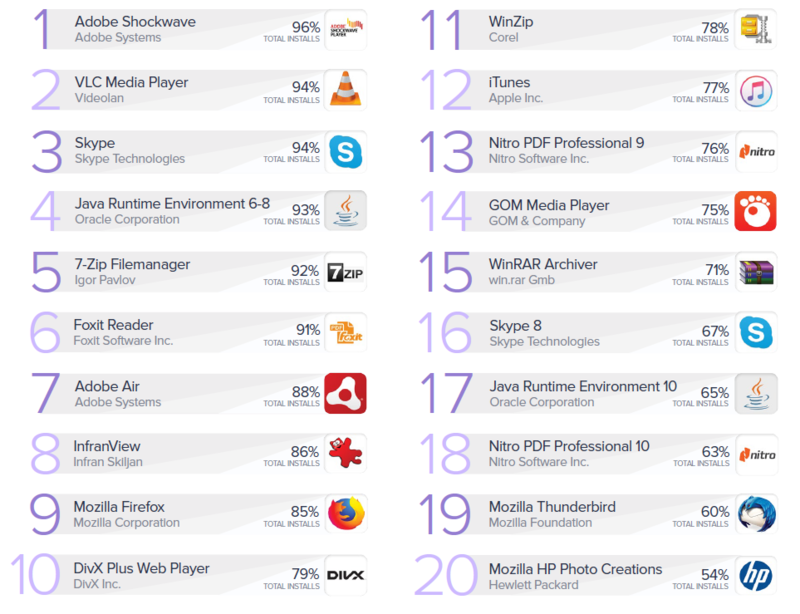 In 2018, the most installed software on millions of PCs worldwide included Google Chrome, Adobe Reader, WinRAR, Microsoft Office, and Mozilla Firefox. That’s a lot of web browsing, working, and reading going on worldwide! Odd: The long-abandoned “Windows Live Essentials” is still installed on 16% of all measured PCs worldwide. Our advice: If you’re not using it, get rid of it. 55% of all installed apps are not the latest versions. You read that right — the most installed PC software, like Skype and Java, are not being kept up to date! Topping the list are Adobe Shockwave and Java Runtime versions 6-8, both of which are horrendously outdated and should be either uninstalled (if not needed) or updated to the latest versions. Our advice: Uninstall Java and see if everything still works. In many cases, you may have installed Java for an app that you don’t use anymore. And, while it might be ok to run older versions of some apps, crucial ones like browsers (Mozilla) and email clients (Thunderbird) should always be updated to avoid potential security issues. Another good example is number 2 on the list, VLC Player. With each new version, VLC introduces new features and bug fixes you don’t want to miss out on. 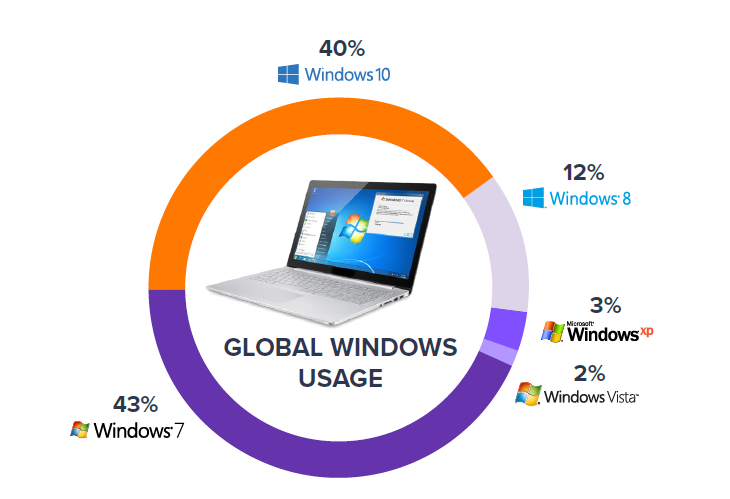 Yes, Windows 10 will soon overtake Windows 7 as the most used operating system worldwide. That’s the good news. The bad news is that 13% of all Windows 10 users aren’t even running the latest version. Instead they are using older versions such as Windows 10 RTM or the Windows 10 Creators Update, neither of which are being supported by Microsoft anymore. All we can say is update, update, update. 4. 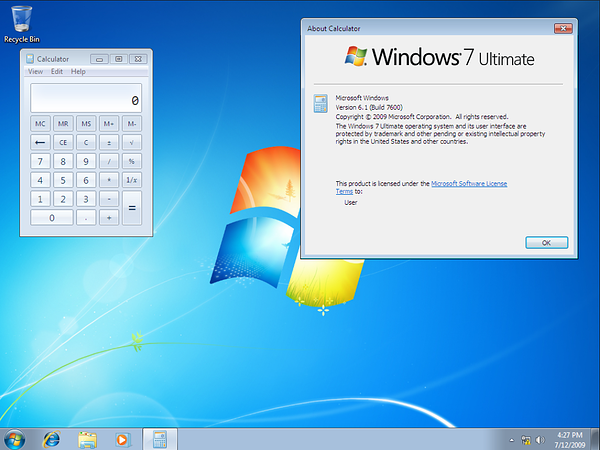 Windows 7 — Millions are out of date! Even Windows 7 users aren’t on the latest release, Service Pack 1. Out of all Windows 7 desktop PCs, we saw that 15% are still running the initial “RTM” release from 2009. Running Microsoft Office? Well, you better make sure you’re not among the 15% who are still running Office 2007, which Microsoft has abandoned. The same will happen soon for Office 2010, as its lifecycle will end in 2020. Fortunately, only about 3% of users worldwide have Office 2010 installed. We’ve pulled this data together from over 163 million devices. By far the most alarming discovery is how many users are running outdated software, but there was a lot to glean from this global study. Read the full 2019 Avast PC Report for yourself, and, please, update your software. In an upcoming blog, we’ll talk about the trends in hardware and show you what CPUs, RAM, hard disks (and more!) people are using worldwide. Stay tuned.